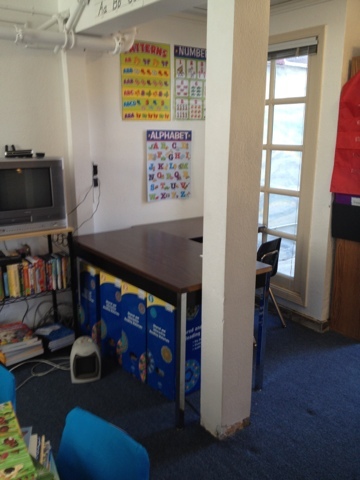 The Lower Elementary Cottage: Focused Fred is on Task! New Classroom Walls! Focused Fred is on Task! New Classroom Walls! My friend the speech teacher is going to hate me for sharing this! 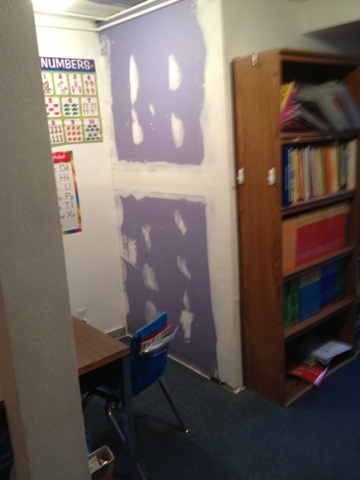 Sorry Kari it's totally worth writing about :) Look below to see the new walls that suddenly appeared in my class! I teach some VERY easily distracted little kids. Kids with autism are not known for their ability to stay on task for non-preferred activities. 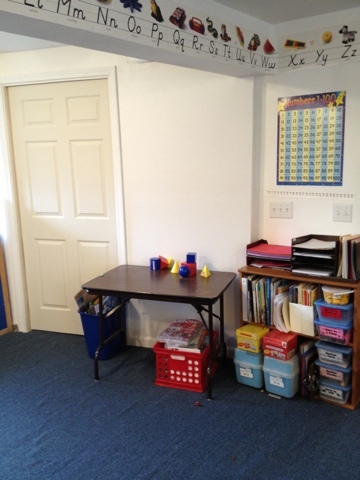 My speechy friend upstairs and I were trying to think of ideas to help them stay focused. I started with sticky notes on the table for specific kids. I gave the kids a star every time I caught them staying on task without a reminder. It was pretty successful! Next Kari and I wanted to come up with a cute "unthinkable" (Social Thinking, Michelle Garcia Winner) to describe the good behavior besides boring "staying on task." Kari created "Focused Fred" and made me these super simple little 10 frame laminated sheets to replace the sticky notes I was using. 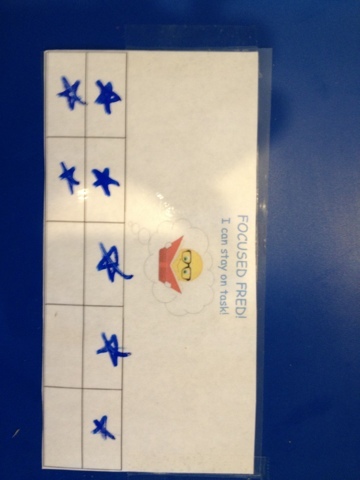 I tell my kids they are being like Focused Fred and give them a star every time they stay on task. When they fill up the 10 frame they get a sticker/prize. It's really starting to work! I used an overhead marker and wipe it off with a wet paper towel when it's full. I walked in my room today crossing my fingers that the construction workers finished my wall (that used to be a window) and painted it. Much to my surprise, not only was it done, but there was a 2nd wall! 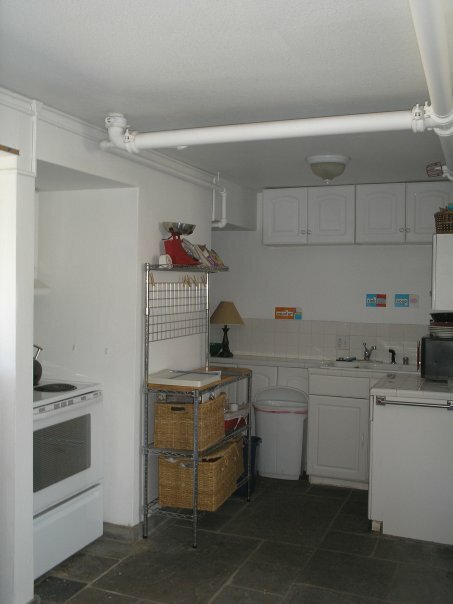 Take a peek at the before and after pics! Forgive the blurry, I was in a hurry to clean up. 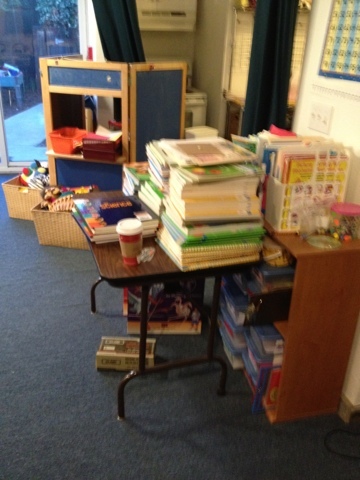 Note the messy shelves! Mostly fixed shelves! I'm done with the left. It has all of my curriculum separated by subject (reading, social studies, science, and math). I'm still working on the right. It has supplemental materials, books on CD in 1 gallon storage bags so the book and CD stay together. 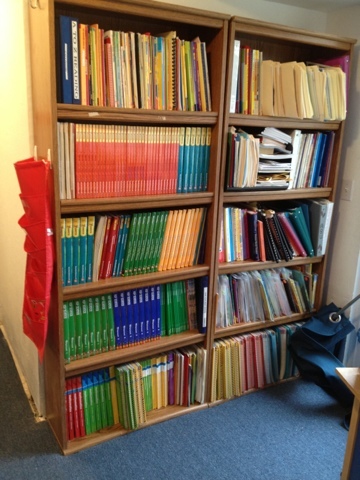 On the bottom are all my tall curriculum manuals. Three grade levels of 5 subjects is a lot of stuff!! 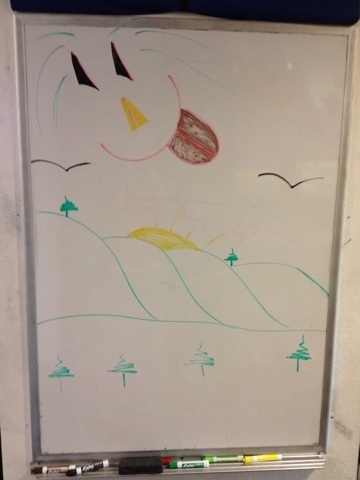 Then the construction guys were apparently having some fun and drew us a picture!! A Fabulously Perfect Day, Plus Chinese Acrobats! Sensing Seasons Success! Wigglebottom Update! Martin Luther King, Jr. & DIBELS Success! 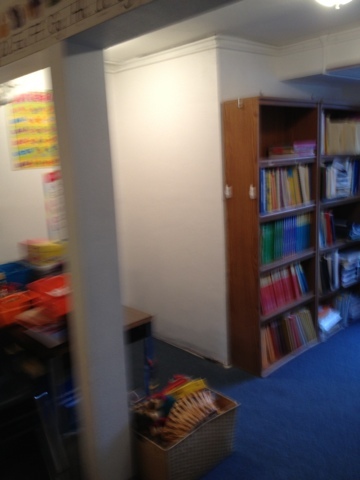 Pardon our dust... A classroom construction zone! Tablet for the Teacher! Enter to Win!